The main goal of AirSafe.com is to provide the public with useful and reliable information about airline safety and security. 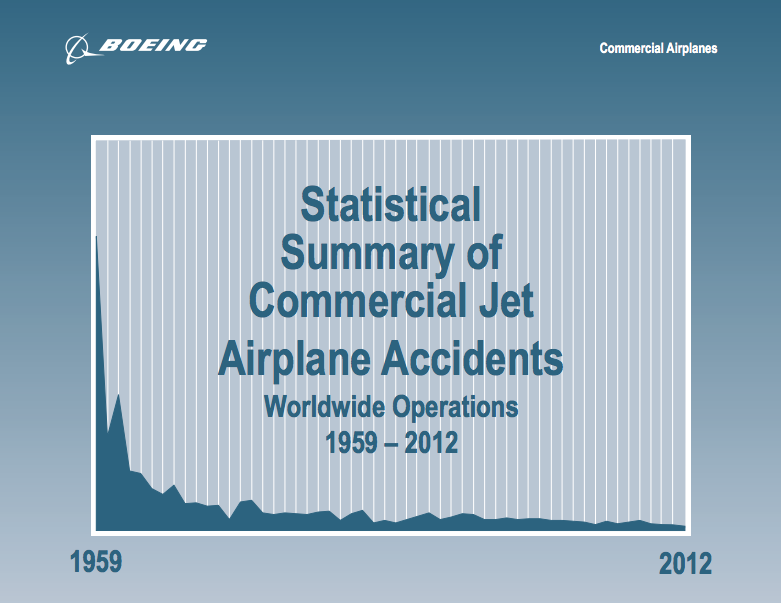 One of the best sources for information about accident rates for specific airline models is Boeing's Statistical Summary of Commercial Airplane Accidents. The newest edition, covering the period from 1959 to 2012, was released in August 2013, and includes a variety of resources, including a summary of selected airliner crashes from 2012, as well as comparative data on the accident rates of various aircraft models. This publication is very useful in part because it provides a snapshot of accident trends for different aircraft models and for different areas of the world. It is also useful for the AirSafe.com audience because it provides a different point of view. These differences are most noticeable if you compare AirSafe.com's safety review for 2012 with the list in the Boeing publication. While there is some overlap between the two annual lists, particularly the crashes that resulted in passenger deaths, there are some key differences. Boeing, like much of the airline industry, has a focus on events that cause significant and unrepairable damage to aircraft, and their accident statistics reflect that focus. While AirSafe.com does make note of a number of nonfatal events, only those events that result in passenger deaths are used in any statistical comparisons on the site. Also, Boeing does not list events, even ones involving passenger fatalities, if it involved aircraft designed in the former Soviet Union, or events involving turboprop driven airliners. In spite of those differences, Boeing's Statistical Summary is one of the industry publications that has very high quality data, and should be consulted by anyone who has an interest in airline safety, especially to answer specific questions about airliner accident rates and how they have changed over the last several decades.